As spring approaches and the snow begins to melt, it’s easy to let the dangers associated with cold weather slip your mind. But while you may be getting ready to put your winter coats in the attic, it’s probably best to leave your dog’s sweaters and hoodies out for a few more months. According to the National Climatic Data Center, half of all US states report an average springtime temperature in the 40s or lower. With temperatures dipping even more in the early morning and evenings, this means that many dogs around the country still have plenty of chilly walks in store for them this spring. With cold weather still a concern, it’s important to continue to exercise caution. 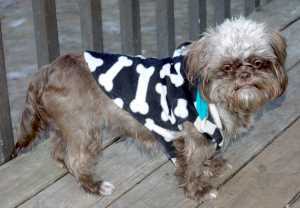 Puppies and elderly dogs are more vulnerable to frigid temperatures, as are small breeds and breeds with thin coats. But temperatures aren’t the only concerns as the seasons begin to turn. Don’t assume that your dog can stay outside for prolonged periods of time just because of the date on the calendar. Springtime can sometimes be just as cold as winter, and there is an increased risk of lightning and thunderstorms as the season progresses. Below you’ll find helpful tips to make your pooch’s transition from winter to spring as safe as possible. Take special care with older dogs, whose joints may get stiff in brisk weather, making sure to adjust the length of your walk according to the temperature outside. A checklist on small dog springtime safety would not be complete without a word about sidewalk and road dangers. Watch out for pot holes and broken pavement which may have developed during the winter. They can be hazardous not only for automobiles, but also pedestrians taking their dogs for a walk. Puddles are NOT safe drinking water. The Humane Society of Connecticut warns that the chemicals used to melt snow on roadways can work their way into roadside puddles, and puddles on grass may contain garden and lawn chemicals. Only allow your dog to drink from his or her designated bowl. Coolant and antifreeze are lethal to dogs. Store these products away from your pets and continue to make sure that your car is not leaking fluids, especially since your dog may be beginning to spend more time outside. Make sure window and door screens are secure and undamaged, so curious pets cannot find their way outside if a sliding door or window is left open for a springtime breeze. Flowers may already be starting to pop up in warmer climates. Those beautiful flowers we can be toxic if ingested by your dog. According to Dog Whisperer Cesar Milan, veterinary clinics start to see an uptick in kennel cough as spring progresses, as dog to dog contact increases. Now is a good time to make sure your dog’s vaccinations and medications are up to date. Mosquitoes, fleas and ticks are also becoming more prevalent as the weather improves. Not only are they annoying, they also carry disease. Mosquitoes carry heartworms. Ticks are responsible for Lyme Disease and Fleas bring their share of misery so be sure top protect your dogs from external parasites. Keep your dog’s bed positioned away from drafty windows. If your house is cold, consider leaving a blanket in your dog’s bed. 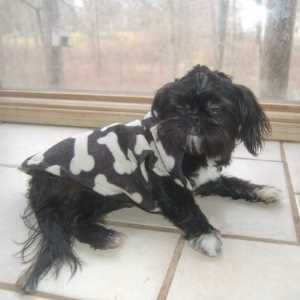 Finally, follow the Humane Society’s advice and keep a dog sweater, hoodie or coat handy in cold weather. Low temperatures are still prevalent in the spring, and going from a warm house to the chilly outdoors without insulation isn’t fun for anyone, not even your dog.